Today I have some exciting swatches from Tara's new collections. 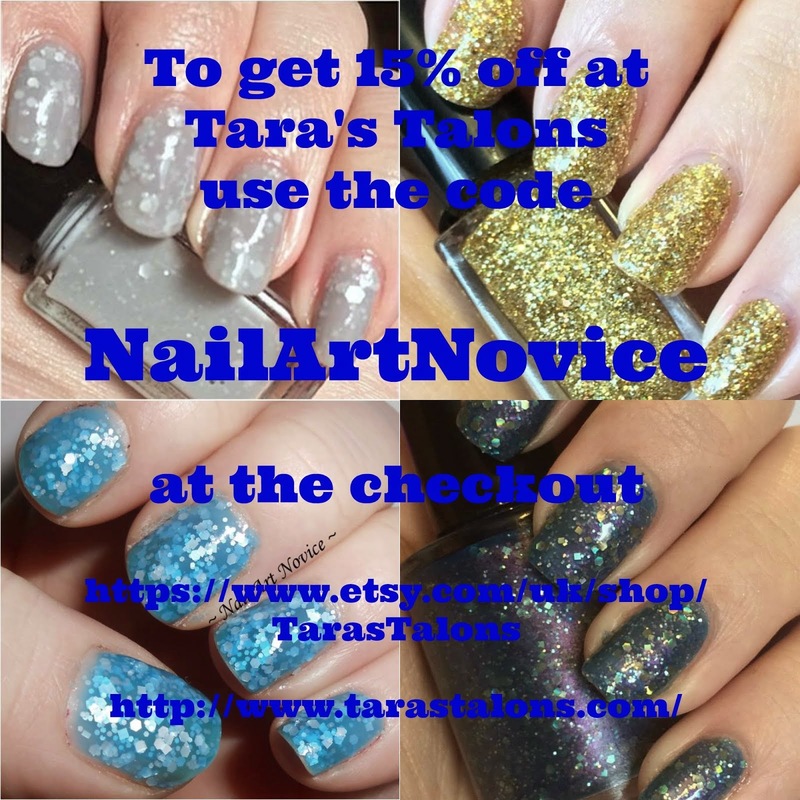 Tara's Talons is re-opening on Sunday at 1 minute past midnight and she has four new collections on offer for you. Today I have swatches of polishes from the Autumn and Return of the Randoms collections, and there's also a halloween collection based on the movie Scream and a topcoats collection featuring four different top coats to make your manis look even more fabulous. First up is Back To School from the autumn collection. This is three coats. It's a grey crelly with what looks like at first just black mini glitters in it but when you get it on you notice that there are some blues and holoy glitters hidden in there too. Application was smooth and easy although the finish was a little rough, but nothing that a layer of topcoat couldn't fix! This was in one of Tara's new mini bottles-still 5mls but now round so they match her larger ones-and with new shiny labels too! Next up is Blackberry-also from the Autumn collection. Again this is three coats, although I only needed two for opacity. It's a gorgeous purple with a fuchsia shimmer and plum coloured hexes. This one went on really smoothly and has a really gorgeous shiny colour. It's really opaque-almost a one coater. The only "problem" (for want of a better word) I found was that as it was so opaque the hexes got lost in multiple layers and just added a strange bumpy texture to the nail instead (you can kind of see this at the top left of my middle nail-although it was more noticeable in person). I'd say thin coats or a single coat over undies would be the best way to wear this one if you didn't want that to happen. This one has a slightly tricky formula in that it dried fairly quickly, so thin coats are needed and you have to work quite fast as you do so. It dries ever so slightly matte so needs a lick of shiny topcoat to bring out its full potential-but I think it's really lovely! I can see me wearing this one a lot. Last but not least is Rainbows which is also from the Return of the Randomness collection. A gorgeous glitter bomb of every colour and size of glitter in a bottle. One coat over Back to School and two over Barry M-Crush. Even from the mini bottle I had no trouble getting glitter onto my brush-it came out well loaded with the bigger shapes every time. I had to space them out a little given the tendency to clump together but that's how it is with all glitter bombs like this. Personally I think everyone should own at least one polish like this one because they're fun and bright and awesome. I'm loving them over autumnal colours right now too. So that's my swatches, which one's your fave? Really great colors these are! I like Back to School a lot.